Earning a college degree is a big commitment, whether you plan to get your associate’s degree or further your education earning a degree at the graduate or doctoral level. At the same time, life is fast-paced, meaning dedicating 100% of your time to earning your degree may not be a realistic option. Many students need to juggle school with family, full or part-time work, or other commitments and at the same time, tuition prices are rising across the board, making it harder and harder for the average, working American to attend college or university. For these reasons, students today are looking for an alternative and finding it in online accredited degree awarding programs. Today earning a degree fully online today is considered a respected avenue for completing college and most major colleges and universities offer courses and degrees fully and partially online. This Value Colleges Best Top 7 list highlights the best of the best when it comes to online learning in the Washington D.C. area. The schools all offer degrees that can be earned 100% online and from the associates to graduate levels. Some schools also offer certificate or continuing education programs. Each institution has a solid ROI and institutional accreditation, meaning the programs are affordable and oftentimes, career-focused. Please note that the annual tuition prices listed below reflect the national IPEDs data and you can visit each individual school to calculate your online costs based on your individualized program. George Washington University makes a point to enrich students lives by taking advantage of all Washington D.C. has to offer, by incorporating local service, internship, and learning opportunities for classroom academics. A community service project at George Washington University may mean meeting a service challenge from the First Lady of the United States, or taking an art course may mean exploring masterpieces in world-class museums. A leader in research education as well, students from around the globe come to get the best of hands-on experience and class A academics, both on campus and online, at George Washington University. George Washington University online is equally dedicated to producing the next generation of local, national, and global leaders and degrees are available in the liberal arts, education, medicine, business, nursing, and more, fully and partially online. Online students benefit from the flexibility of completing coursework and attending classes online, while still partaking in as many or as few real-world experiences, such as internships or service projects, as they choose. American University is a student centered research institution located in the heart of our nations capital. The university is Methodist affiliated and the diverse faculty is internationally renowned and students from around the world attend American University annually both on the traditional campus and through the schools online platform. In addition to all fifty states, over 120 countries are represented through American University’s student body. Students are trained to become experts in their fields and global and local leaders. At American University online students benefit from 24/7 access to all courses and materials and the same qualified faculty that teaches on the traditional campus teach the online courses as well. Students additionally have access to library and student services, advisement, and career counseling, plus they have the opportunity to participate in service projects or internships if they choose. All online degrees offered are at the graduate levels and include programs such as Project Management, Education, or Strategic Communication. 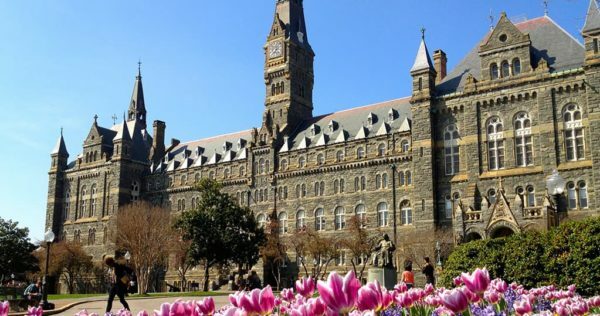 Founded in 1978, Georgetown University is the nations oldest Catholic and Jesuit university. It is known worldwide as a leading academic and research institution and students and faculty are dedicated to combining top notch classroom academics with real-world opportunities and applications. Additionally the school draws upon it’s Jesuit heritage to incorporate faith and service into all curricula and the university serves a diverse student body with enrollees from all walks of life and faiths. Georgetown University online has a strong commitment to ensuring students can complete their degree programs in a flexible and accessible manner. All online courses are delivered on a flexible platform that allows students the time to complete their work around their busy schedules. Online students get the same rigorous academics taught by the same qualified staff that teach on the Georgetown traditional campus. Georgetown online offers bachelor and master degrees, plus three professional certificate programs. 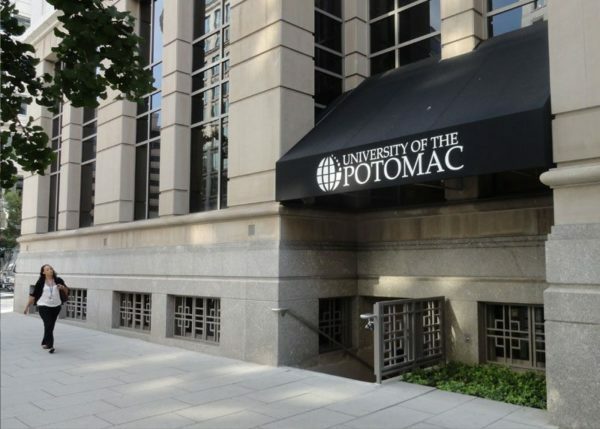 Located in the heart of our nation’s capital, the D.C. campus of the University of the Potomac combines rigorous academics with authentic career based experiences for all students enrolled, both on campus and online. The school is fully accredited to award degrees at the associate, bachelor, and master levels. In addition to their main campus, D.C. campus, and their fully online campus, students can also participate in hybrid programs where they complete most of their coursework online, on their own schedule, and attend lectures on campus once a week. This is a ‘best of both worlds’ scenario for students who need the flexibility of online learning, but who still want the experience of classroom learning. The online school at University of the Potomac specifically designs its courses to be taught by industry professionals, ensuring students the best of the best when it comes to academics paired with applicable career-based knowledge. The school also updates all online courses regularly in order to keep up with the “world’s constant academic evolution in online education.” Current online programs include degrees at the associates or bachelor levels in areas such as Accounting, Business, or Hospitality and Tourism. 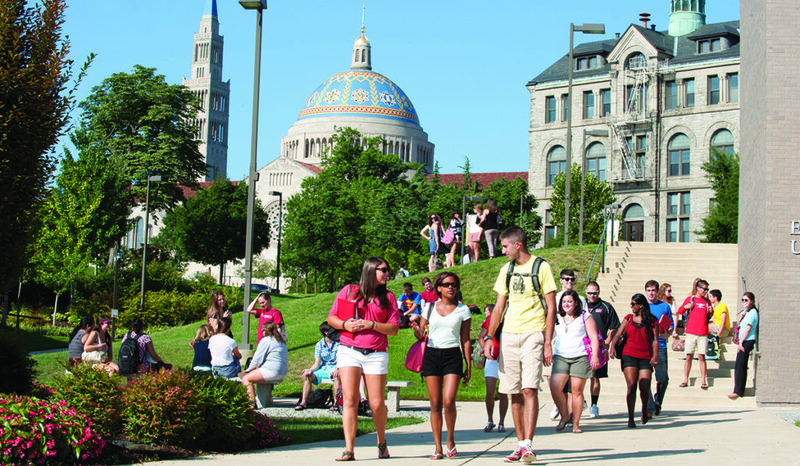 Founded in 1887, the Catholic University of America boasts unique beginnings, founded by the Catholic bishops of the United States to be the national university of the Catholic Church in America. The founding group received a charter from then Pope Leo XIII and in staying true to it’s heritage, today the Catholic University of America aims to cultivate new generations of Catholic Minds through rigorous academics, real world experiences, and faith based curricula. The university is accredited to award degrees in both the undergraduate and graduate levels. The Catholic University of America online school is also rooted in the main campus’ Catholic heritage and combines faith based learning with accessible and challenging, applications based curricula for students enrolled in courses from across the nation. The online school aims to prepare students for success in the work force and courses are focused on real world applications of knowledge. Some fully online degrees offered include a Master of Nursing degree and a Doctor of Ministry in Liturgical Catechesis, as well as a variety of online certificates and licentiates. Gallaudet University is the world’s only university designed to be barrier-free for hard of hearing or deaf students and for 150 years the university has been a leader in serving and educating deaf and hard of hearing students from across the globe. The school is also the only interpretation B.A., M.A. and Ph.D. program in American Sign Language-immersive environment in the world and the worlds largest publisher of books about and for the deaf community! Gallaudet University online school offers four online master degree programs, two fully online and two hybrid, and one Bachelor Degree completion program. 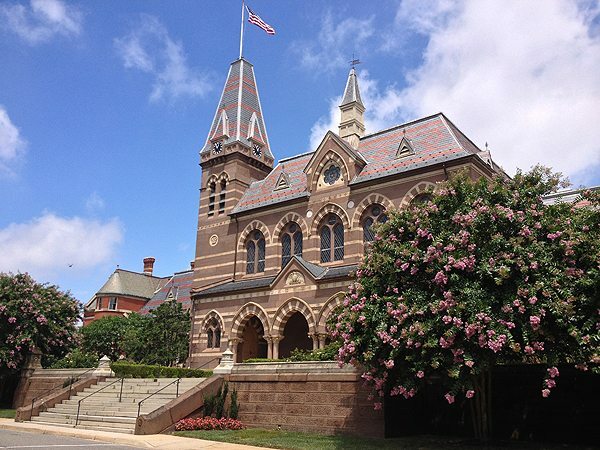 Gallaudet online also has a handful of professional development certificates such as Educating Deaf Students with Disabilities or Peer Mentor Training. All programs are set up to serve students who need to juggle school with their busy lives and job or family commitments and the online school is committed to serving the deaf and hard of hearing community. Howard University was founded in 1867 and is a private, federally chartered, doctoral university and a high research institution. The university is accredited to award degrees in over 120 different areas of study through thirteen different schools, at the undergraduate and graduate levels. As a leader in research education, Howard University is known for producing cutting-edge research in areas such as nanotechnology, atmospheric science, and human genome research. Students from around the world attend Howard online or on campus in order to participate in these unique and innovative research opportunities. Howard University online offers certificate and bachelor degree programs online. These programs are for students who want to benefit from the esteemed academics that Howard provides but are unable to attend class on campus. Online learners can apply and enroll during the fall, spring, or summer semesters. Some of the online programs include a Bachelor of Science degree in Clinical Laboratory Science or an Executive MBA.